NAPIT are committed to high standards of safety in the home. We ensure our registered installers meet strict entry requirements and are regularly assessed to ensure their ongoing competence. 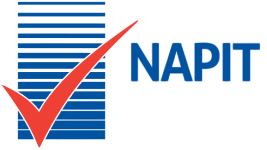 By choosing a NAPIT registered tradesperson, you can have the confidence and peace of mind that comes with knowing that the installer working in your home is able to comply with the relevant building regulations and industry safety standards."